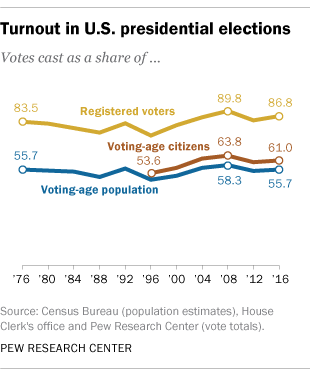 Nearly 56% of the U.S. voting-age population cast ballots in the 2016 presidential election, representing a slight uptick compared with 2012 but less than in the record year of 2008. 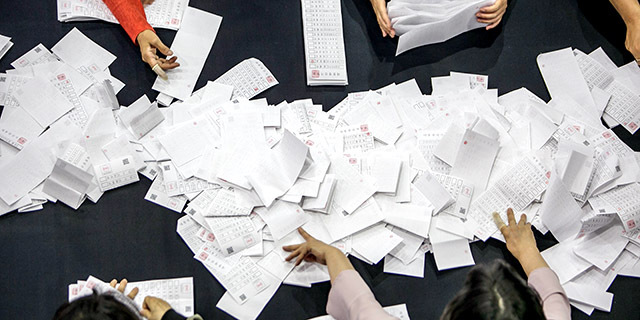 While most Americans – 70% in a recent Pew Research Center survey – say high turnout in presidential elections is very important, what constitutes “high turnout” depends very much on which country you’re looking at and which measuring stick you use. The Census Bureau estimated that there were 245.5 million Americans ages 18 and older in November 2016, about 157.6 million of whom reported being registered to vote. (While political scientists typically define turnout as votes cast divided by the number of eligible voters, in practice turnout calculations usually are based on the estimated voting-age population, or VAP.) Just over 137.5 million people told the census they voted in 2016, somewhat higher than the actual number of votes tallied – nearly 136.8 million, according to figures compiled by the Office of the Clerk of the U.S. House of Representatives, though that figure includes more than 170,000 blank, spoiled or otherwise null ballots. That sort of overstatement has long been noted by researchers; the comparisons and charts in this analysis use the House Clerk’s figure, along with data from the International Institute for Democracy and Electoral Assistance (IDEA) and individual nations’ statistical and elections authorities. The 55.7% VAP turnout in 2016 puts the U.S. behind most of its peers in the Organization for Economic Cooperation and Development (OECD), most of whose members are highly developed, democratic states. Looking at the most recent nationwide election in each OECD nation, the U.S. placed 26th out of 32 (current VAP estimates weren’t available for three countries). The highest turnout rates among OECD nations were in Belgium (87.2%), Sweden (82.6%) and Denmark (80.3%). Switzerland consistently has the lowest turnout in the OECD: In 2015, less than 39% of the Swiss voting-age population cast ballots for the federal legislature. Chile’s situation points to yet another complicating factor when comparing turnout rates across countries: the distinction between who’s eligible to vote and who’s actually registered to do so. In many countries, the government takes the lead in getting people’s names on the rolls – whether by registering them automatically once they become eligible (as in, for example, Sweden or Germany) or by aggressively seeking out and registering eligible voters (as in the UK and Australia). As a result, turnout looks pretty similar regardless of whether you’re looking at voting-age population or registered voters. In the U.S., by contrast, registration is mainly an individual responsibility. And registered voters represent a much smaller share of potential voters in the U.S. than just about any other OECD country. Only about 64% of the U.S. voting-age population (and 70% of voting-age citizens) was registered in 2016, according to the Census Bureau report, compared with 91% in Canada (2015) and the UK (2017), 96% in Sweden (2014), and 99% in Slovakia (2016). As a consequence, turnout comparisons based only on registered voters may not be very meaningful. For instance, U.S. turnout in 2016 was 86.8% of registered voters, fourth-highest among OECD countries (and highest among those without compulsory voting). But registered voters in the U.S. are much more of a self-selected group, already more likely to vote because they took the trouble to register themselves. There are even more ways to calculate turnout. Michael McDonald, a political scientist at the University of Florida who runs the United States Election Project, estimates turnout as a share of the “voting-eligible population” by subtracting noncitizens and ineligible felons from the voting-age population and adding eligible overseas voters. Using those calculations, U.S. turnout improves somewhat, to 59.3% of the 2016 voting-eligible population. However, McDonald doesn’t calculate comparable estimates for other countries. No matter how they’re measured, U.S. turnout rates have been fairly consistent over the past several decades, despite some election-to-election variation. Since 1976, voting-age turnout has remained within an 8.5-percentage-point range – from just under 50% in 1996, when Bill Clinton was re-elected, to just over 58% in 2008, when Barack Obama won the White House. However, turnout varies considerably among different racial, ethnic and age groups. In several other OECD countries, turnout has drifted lower in recent decades. Greece, which has a compulsory-voting law on the books (though it’s not enforced), saw turnout in parliamentary elections fall from 89% in 2000 to 62% in September 2015. In Norway’s parliamentary elections last year, 70.6% of the voting-age population cast ballots – the lowest turnout rate in at least four decades. And in Slovenia, after a burst of enthusiasm following the country’s independence from Yugoslavia in 1992 (when 85% of the voting-age population cast ballots), turnout fell rapidly – sinking to 54% in 2014, a drop of 31 percentage points in just over two decades of democracy. On the other hand, turnout in recent elections has bumped up in several OECD countries. In Hungary’s parliamentary elections this past April, nearly 72% of the voting-age population voted, up from 63.3% in 2014. In the Netherlands, turnout rose from 71% in 2012 to 77.3% in March 2017. And turnout inched above 69% in September 2017’s German parliamentary election – the highest level since 2005. Note: This is an update of a post originally published May 6, 2015.